hello hello hello, sorry I've been away for a while.....I moved back home to the baltimore/dc area. Anyways after I moved back home I got to hang out with a friend from the Phillipines who introduced me to a wonderful philipino grocery store in the area. I asked her a ton of questions and afterwards she introduced me to some wonderful tamarind candy that was spicy, fish crackers (delicious), PORK RINDS (omg way better than what we have here in the US), and the philipino version of sponge cake oh and taro or ube flavoured cake. I basically stuffed my face once we left the store. Afterwards she made her version (after I kindly asked her to) of chicken adobo which was fan freakin tastic. I ate 3 drumsticks and so did my sister, we both really enjoyed it. While at the store, I bought an older version of the phillipino food magazine "FOOD". I love the magazine, but unfortunately 95% of the magazine has more Spanish influenced food in it. In the "letters to the editor" section, a woman talks about making a stir fried crab with chile and garlic recipe. Now this sounds more like my kind of recipe. doddie, I'm looking you're way. I am happy that another foodie is introduced to the delights of Filipino cuisine. But first things first. Phillipines is spelled with one "l" and two "p" - Philippines. Our tiny country of islands are named after the spanish king Philip. And with referring anything about/concerning the Philippines, it is usually called Filipino, so Filipino cuisine. There are different types of Filipino cuisine, we are after all composed of 1,700+ islands. And these islands are distinguised by 3 main parts Luzon, Visayas and Mindanao. I have been fortunate to have lived in all three regions. Filipino cuisine is as varied as the Chinese. For example, dishes from the rugged Ilocos region up north is more vegetable-centric (usually what is found in backyard gardens) and mostly incorporates the use of fermented fish sauce. In the Pampangga province (considered the culinary center of the country), is known for its charcuterie like tocino (sweetened pork) and longganisa (Filipino sausage). 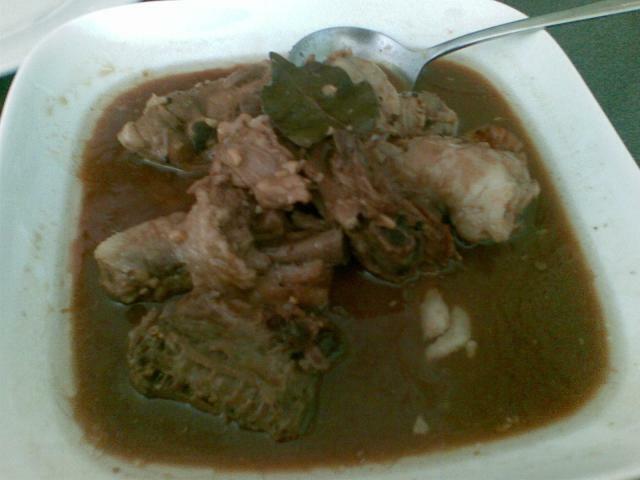 It is also reputed that the famous Kare-kare stew (Beef in savory peanut stew) has originated from here. Then we have the Bicol province that is known for its heavy use of coconut cream and the delightfully hot "bird chilis" (called siling labuyo, once considered the hottest chili pepper by Guiness Book of Records) in their various viands. Down South, like in the Visayas where seafood is abundant, there is a lot of grilled seafood like grilled marlin head and various types of cerviche called "kinilaw: in Tagalog. 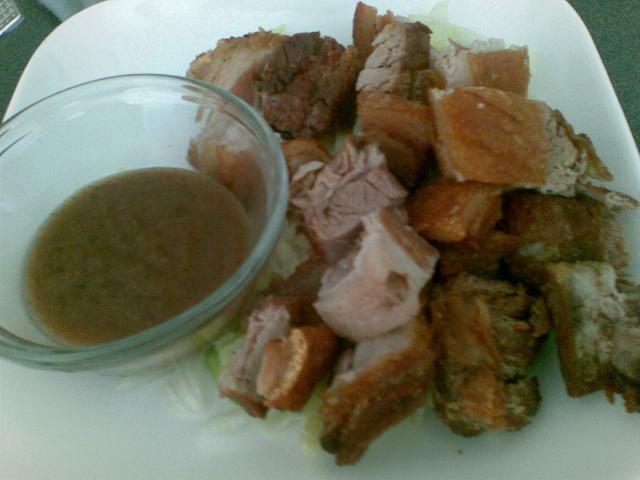 Cebu is known for its roasted pig or lechon, while in Iloilo batchoy (noodles with pork offal) reigns supreme. Chicken inasal (Chicken marinated in Ginger, lemongrass and vinegar) also hails from here. In Mindanao, where there is a predominantly large Muslim population, coconut cream is also used in a lot of the dishes but with the addition of turmeric, coriander, ginger, chilis, etc. In my hometown, Cavite city, our dishes are Spanish oriented, I can even say South American-oriented. Most of the popular dishes are menudo, callos (tripe with garbazo beans in tomato sauce), morcon, mechado, afritada, etc. As for Filipino recipes, I'll be glad to oblige with traditional simple lunch fare recipes (mostly vegetables). As for the sponge cake and ube (Taro) spongecake, that would entail a call to my mother who knows how to make it. Here's a simple Filipino recipe that is a common side dish for lunch. 1. Take your pork piece, wash it very well and put in a small sauce pan with 2 cups of water and boil until tender (20-30 minutes). Take the cooked pork and cut into 2 inch strips, set aside along with the pork broth. 2. In a wok, add your vegetable oil, heat it until hot. Add cut up pork and fry until golden brown (be careful of the splatters). Add garlic and saute until golden brown and then add onions. Stir-fry everything for a minute. Add your squash chunks and mix everything up. 3. Add coconut cream and fish sauce, turn down the heat when it start to simmer. Let everything simmer for 15-20 minutes until the squash is tender. Salt and pepper if you think it still needs it. Serve hot along with something fried or grilled (fish or pork) with rice. This is a favorite lunch side dish in my family. Batard, you are right, kare-kare differs from each family (kinda like gumbo is prepared differently by different cooks). In my family, my mother and grandmother absolutely forbid the use of peanut butter in kare-kare, only toasted ground peanuts and rice. Also, there are the choice of veggies, my family likes asian eggplants, yard long beans, banana heart and bok choy in the stew. And bagoong (fermented shrimp paste sauteed in garlic and vinegar) is a must condiment on the side. I think almost all Filipino love halo-halo (well except me, the freak of the family as my mom would call. Note: everyone in my family AND clan has a sugartooth). My mom would make halohalo from scratch. First, she would cook strands of macapuno (aberrant coconuts that have thicker meat and almost no water at all) in sugar. Also cooked in sugar (seperately), are plantain chunks, garbazos (chickpeas), jackfruit and red beans. Then there was the making of leche flan (egg custard) and ube (sweet purple yam). Looks like a lot of ingredients for a simple dessert right? But it is how you serve halo-halo that is so special. First get a tall sundae glass. Fill it to 2/3s full with crushed ice (hand shaved, even better). Then add a tablespoon of each: beans, sweet plantains, garbanzos, jackfruit and macapuno. This will fill the glass up to the brim. But wait, you have to add a chunk of leche flan and a tablespoon of ube on the very top. And if you really want it to make it extra special, carefully add a small scoop of ice cream on the mound and a sprinkle of pinipig (toasted young rice). And to complete the extravaganza, a drizzling of evaporated milk. You stop drizzling the milk when you see it has reached the bottom of the glass. PS. you can tell halo-halo making is serious business in my family. Don'tthis topic on Filipino food. Not entirely about food, but you'll find some good information there, especially about food from different regions. I like Halo Halo with Nata de Coca. I like the Macapuno Sport Balls. Ummm...I think that's nata de coco. thanks everyone, especially doddie, for the great recipes and interesting info. I found a Japanese Filipino recipe book today...it had the squash recipe Doddie gives upthread. I have a question about salted/dried/preserved/fish. 1) Where preserved fish is cooked with vegetables, what kind of fish is this? Is it wet-pickled, or totally dried, or salted and dried??? 2) I'd love to hear more about dishes using preserved fish together with other ingredients. (I'm sure the book is not talking about things like shrimp paste etc, but whole preserved fish). Preserved fish is almost exclusively salted and dried here. I'm not familiar with any wet preparation for preserved fish. There is a dish that's basically fresh fish "cooked" in acid (kinilaw) but I'm not aware this is used for any purposes of preservation. Salted fish - freshly caught fish is fileted, cleaned and thoroughly salted and hung out to dry in the sun (preferably by the sea, on the beach). Wet salted fish - or called binuro, fish is salted and then packed in jars and left to preserve and ferment. So far that's all I know right now. If you do really want to know how to make salted fish or wet salted fish, I can ask my parents who can ask their elders how to make it. My father is from Cabanatuan, Nueva Ecija and he grew up eating "buro".... their vesion of this wet salted fish is a light color pink. It smells really funky but i always end up eating more of everything, especally rice when we have this as a side dish. Buro is good stuff. I remember it having ginger and rice and supposedly left out for a few days. I think the rice helps trigger the fermentation process. Anyone ever tried making this at home? My dad is from Pampanga and they have an assortment of buros, like dalag and baboy. Funny thing, I just started a jar of pork buro. Once fermented, it is sauteed and served like a condiment with poached vegetables like eggplant and zucchini (aioli substitute..hehehe) or just with plain rice. But this dish is one of many dishes that is served at family gatherings. My preserve (sour like pickles) should be ready in a little over a week outside the fridge. To avoid the buro turning funky, use newly cooked rice but cool it down first, instead of the usual hot rice mixed with the fish or pork. Always on the look out for new cuisines to try (new = unfamiliar to me), I very recently had my first Filipino food experience (went to a restaurant that was popular amongst the Filipino community). I would have dabbled in a bit of everything from the menu but alas, there was only myself and a single other friend. I had chicken adobo, something similar to crispy pata (I forget the name...basically, I ordered pata but we were told they ran out and that we could have something very similar, the only difference being the pork piece was ribs instead of leg), lumpia and halo halo. Sorry for the poor quality pictures...my phone isn't capable of taking clear photos and doesn't have flash (note to self: next phone must meet the requirements of the Code of Food Photography)! Now this was interesting. I've read lumpia is basically the same/similar to popiah. 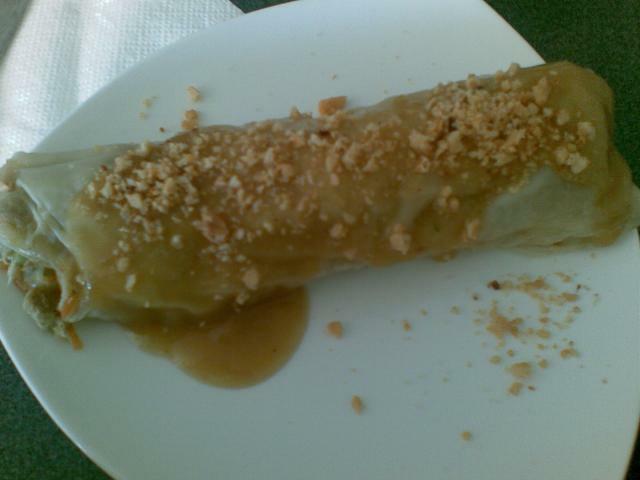 I eat popiah at home (and boy is it good) and so I was half expecting lumpia to be very similar, yet the other half was very excited to see how the Filipinos served it differently. Seeing as lumpia (as is popiah) is in fact Chinese in origin, I was surprised at how 'un-Chinese' it tasted! The main difference being the filling...and sauce...and skin. The sauce was more like a gravy -a slurry almost. It was sweet and cornstarch-y. The fillings I have forgotten by now due to my goldfish memory but I do distinctly remember (by remember, I mean analysing the picture) there being julienned carrots, a variety of vegetables and I recall prawns (minced or something like that). Anyhow, I'm sure like popiah, lumpia fillings differs from restaurant to restaurant to family to family (and what's 'best' is always debateable). Ooohh! I say to my friend. This sort of tastes like the Vietnamese banh cuon (if you could imagine banh cuon with a different sauce and without the Vietnamese ham). This came as a surprise to me...even the lumpia skin reminded me of the rice wrapper for banh cuon. Maybe it's also the way the sauce is poured on top instead of either dipped or spread inside (like I do with popiah at home). I'd have to say I much prefer my home version of popiah. Upon hearing about this famed dish from the Phillipines, I was extremely excited. The verdict? Yummy! Admittedly, the chicken could have been of better quality (which meant the dish would have been improved in that sense) but hey, I'm at a casual local sort of restuarant where food is simple and cheap. This isn't fine dining and the chicken was tender enough. Anyway, the sauce was delicious and not at all too foreign for my palette. It tasted like good ol' homestyle Asian food and could easily fit into the daily cooking of my home. I detected some vinegar, which I looove, and I saw some crushed peppercorns floating in the sauce (not clear in photo). I eagerly spooned the sauce over my rice. Mmm! What can I say, I love sauces of almost every kind and this particular one served with the crisp skinned pork was decidedly addictive! The letdown was that a few pieces were sort of stringy and tough (which meant I had to fish out some 'meat floss' from my teeth *ahem*) and were thus left untouched. Well with all the rave I hear about this Filipino dessert, how could I miss it (even knowing that I would be unable to finish it)! I suppose I was awaiting a taste of exotica but to me, it was rather similar to alot of South East Asian dessert drinks I've tried but with the added vanilla ice cream. It reminded me a bit of the Burmese faloda I once had (which, ironically, was an acquired taste). There was probably too much ice cream and not enough of the ube. Also, I prefer coconut cream/milk in my Asian dessert drinks, rather than condensed milk (as it was in my halo-halo). I do, however, really enjoy the addition of the palm seeds. There's a bite to it that I find so alluring. Hmm...I think I prefer the Chinese tin bo leung and Vietnamese 3 colour drink. All on all, it was a good experience and I appreciated watching Filipino cable tv as I ate my way through a very very tiny piece of the Phillipines. I'm sure though, that I enjoyed my meal much more than my friend did as she mentioned that we should have went to Korean instead (which because of my greed and random cravings, I went to straight afterwards anyway). 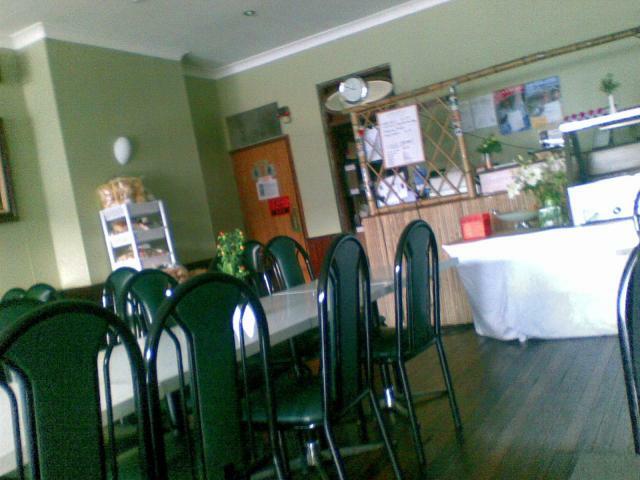 By the way, when we entered the restaurant, we were slightly disappointed that there was only one other table full but never fear, 5 minutes later, family after family of Filipinos started arriving and the place was buzzing. It's kind of funny (abeit slightly awkward) how many of the Filipinos were looking at my friend and I in blatant curiosity (much like how my aunts would when somebody takes home a new bf now that I think about it). Did I sprout a hairy mole on my nose? The sauce can vary-- some are simply garlic, brown sugar and soy sauce in cornstarch, other have peanut butter. Starchy isn't a desirable flavor either. 2. Chicken Adobo- there's considerable variety in the ways to cook Adobo, but the constant is always plenty of garlic. It looks like you have a classic adobo there-- vinegar and soy sauce with peppercorns. My favorite is a pork adobo, with vinegar, soy sauce, chopped red chili, and sour tomatoes that disintegrate. 3. You probably did have Crispy Pata. Pata means "Thigh" in tagalog. It's usually served whole and on the bone, but it's nice to have the place take care of the chopping. The standard way of cooking it is straight-frying it in deep fat, but some unfortunate cuts of meat can indeed be tough and chewy. I like it when restaurants go the extra mile and pressure-cook the thigh before frying (I'm not sure how much of this is in advance). It looks like yours was served with lechon sauce (gravy of roasted liver and brown sugar), which I love, but the ideal sauce in my opinion for crispy pata is simply soy sauce and vinegar with red chili peppers and onions. 4. It looks like the halo-halo was adjusted for the sweet tooth. 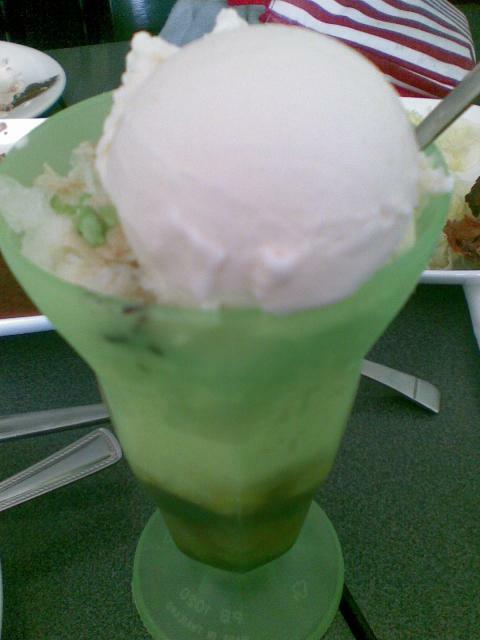 Halo-halo is more commonly served with evaporated milk than condensed. Did you receive the full monty of toppings? 1. Ube 2. Leche flan (creme caramel slice) 3. Chickpeas in syrup 4. Beans in syrup 5. Macapuno (coconut sport) 6. Nata de coco (coconut jelly) 7. Sweet corn kernels 8. Kaong (palm nut in syrup) 9. sweet plantain slices in syrup 10. Jackfruit 11. Pinipig (toasted rice) 12. Ice cream. I'm not a huge fan of beans and coconut in desserts, so if there's a make-your-own bar, I just add bananas/plantains, leche flan, ice cream, pinipig, and milk. Boring, I know. I will definately be on the search for more Filipino food since I've really only just scratched the surface. I've been doing some readings on Filipino cuisine and I continuously come across clashing viewpoints of lumpia: is it made of wheat flour or rice flour? Very confusing. Anyhow, I'm really looking forward to trying lumpia sariwa again (at another place or even better, at a Filipino home) -quality ones this time so I can finally grasp an understanding of the TRUE lumpia taste. I'm thinking of cooking chicken adobo (or maybe pork, but preferably chicken since I've been having too much pork lately) at home some time in the upcoming holidays but not too sure on a reliable recipe yet. I love adobo with alooot of sauce! As for the halo-halo, I'm pretty sure the version I had wasn't the full monty *sad face*. I don't recall any corn kernals, chickpeas, jackfruit, roasted rice and nope, most definately no leche flan otherwise I would certainly have noticed. I loooove flan so that's a real pity to hear. Have no idea where to get good halo-halo here in Oz. I'm really looking forward to tryin sizzling sisig one day. Is there a good ol' reliable recipe for it online? Would I need a sizzling plate fo it (certainly would be better aye)? and see if it sounds feasible. I'm not really a fan (though I do eat it occasionally), so I've no idea what the best recipe is-- it seems the best is always at the local grill-and-bar If you have a cast iron pan, heating it blazingly hot should work. Sizzling plates are not that expensive here-- though they are still very dangerous things on the table! My wife was jonesing for laing (taro leaves) after reading this review of Engeline's Filipino restaurant in Queens (we've been there) a few days ago in the New York Times, and yesterday I happened to be checking out an Asian market I hadn't visited before and found Lucia's dried taro leaves imported from the Phillipines, and I think this is my favorite new ingredient. I've made fresh taro leaves before in Hawai'i, but these dried leaves have a smoky flavor. They don't seem heavily smoked, so maybe the drying process is just finished over fire. They're also not too expensive (about $2.50 for a 14 oz bag) and look like they can be stored indefinitely on the shelf. Though the label, mysteriously, says "keep refrigerated," they're certainly not refrigerated in the market. They can be prepared pretty much like spinach or other greens, but since they're dried, cooking time doesn't have to be long. I made them more Indian style than Filipino, browning chunks of carrot, potato, onion and chicken in ghee with some salt, pepper, garlic, bay leaf, and eventually garam masala, then I added about a quart of chicken consomme and some water and the taro leaves, simmering and adding water as needed. The butter, stock, garam masala, and the smoky flavor of the taro leaves worked very nicely together. Almost 4 years since the last post on this topic. In that time has anyone published a "must have" book on Filipino cuisine? I am currently reading "Memories of Philippine Kitchens" but it is a bit cheffy (naturally since the authors own a restaurant! ).